The European Journalism Centre (EJC) is an independent, international, non-profit institute dedicated to the highest standards in journalism, primarily through the further training of journalists and media professionals. Building on its extensive international network, the Centre operates as a facilitator and partner in a wide variety of training and research projects. Lebanese production company, partner of Euromedcafe in the framework of the project financed by the Anna Lindh Foundation. The Suttvuess Cooperative, which operates in the audiovisual production and post-production field, in collaboration with Doc.it and The Look of Handala Association, is organizing “Astrolabio.doc”, the inaugural Europe-Middle East documentary market to be held between 4-7 October 2007 in Rome. Euromedcafe is partner of the event. Arabic Image for Artistic Production (AraMage) is a private artistic Production Company established at July 2003 in Syria as one of the incubated companies by Mawred NGO, a Syrian NGO under the patronage of Her Excellency Mrs. Asma Al Assad, Syrian First Lady and then moved the head quarter in Egypt . AraMage basic activates includes organization and producing cultural events in Egypt , Syria , Middle East and World in all fields of culture like: music, cinema, opera, theater and fine arts. The MediterRaid is a raid which will go around the costs of Mediterranean, 15.000 km, in April, May and June 2007. 1) one documentary of 40 min. A. Knowledge of communicative, psychological, social and cultural mechanisms which are the basis of IC problems and potentialities. B. Communication methodologies and tools. C. Apply methodologies and tools of IC in specific contexts like institutions, media, business. La rivista ha la struttura di un mensile, con uscita il 21 di ogni mese. All'interno del sito ci sono le diverse rubriche: racconti di viaggio (In Viaggio), enogastronomia (Sapori), cultura (Arte, Musica, Libri) economia (Economia internazionale) racconti di vita (Storie meridiane) e rassegna stampa da vari paesi; racconti e reportage. I collaboratori provengono da: Portogallo, Spagna, Albania, Croazia e Italia. 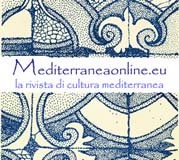 Il sito è alla ricerca di collaboratori che vivano o conoscano bene il Mediterraneo della parte araba, e che conoscano l'italiano, l'inglese, portoghese o spagnolo. En Chordais is a cultural organisation, which has been active since 1993, researching, documenting, studying and promoting the musical traditions of Greece and their creative contemporary manifestations. Special emphasis is given to the common musical experiences that are the hallmark of all the traditions of the eastern Mediterranean. CBAI is a non profit organisation working on intercultural dialogue.